The mountainous landscape of Southern Utah lends itself to a number of amazing outdoor activities. Hiking, fishing, and camping are all popular pastimes. Among them, Brian Head mountain biking is one of the best. There are over 100 miles of downhill, single-track trails, and 100 more of cross-country trails. Biking enthusiasts love the challenge of the trails here. The following are some of the top mountain biking trails in Brian Head. Try them the next time you come to Southern Utah! When you’re on your way to Southern Utah to experience the Brian Head mountain biking scene, make sure you know all the other fun things to do here as well. Be sure to download a copy of our complimentary Southern Utah Vacation Guide when you’re planning your trip. The Vacation Guide is a great way to get to know our area, regardless of how many times you’ve visited. It contains comprehensive information about all the area’s outdoor activities, as well as beautiful attractions and excellent amenities. Find places to eat, exciting events, and of course, the best accommodations in town when you have the Vacation Guide by your side. 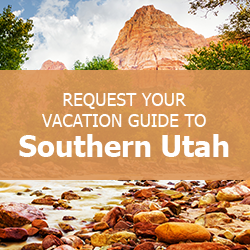 Take the stress out of planning your trip to Southern Utah and download your guide now! This 6-mile Brian Head mountain biking trail is listed as easy to moderate in difficulty. See amazing views as you ride, including vistas of Cedar Breaks National Monument and Ashdown Gorge Wilderness Area. At 12-miles in length and a moderate difficulty rating, the Left Fork of Bunker Creek is for riders who are ready to take on a bit of a challenge. This Brian Head mountain biking trail includes some exciting descents. Wind through an Aspen forest, cross a stream and enjoy every bit of this heart-pumping ride. The Virgin River Rim Trail is for highly experienced mountain bikers. It is listed as strenuous, and is quite long, measuring 33-miles. There are several campsites along this Brian Head mountain biking trail. Riders often enjoy spreading it out over 2 or 3 days. You can access it from several different points, including Strawberry Point, Navajo Lake, Cascade Falls, and Wood’s Ranch. After a fun day on one of these Brian Head mountain biking trails, make sure you explore the rest of what Southern Utah has to offer. See gorgeous scenery, explore picturesque parks, fish Panguitch Lake, or even go zip lining. When the day is done, relax and stargaze at our beautiful night skies. Enjoy a nice home cooked meal at your Family Time Vacation Rental. Whatever you choose to do next, our gorgeous, spacious homes provide some of the best places spend time with your loved ones in Southern Utah! Filled with everything you need for a great trip, many Family Time Vacation Rentals are located in the Brian Head, Duck Creek, and Panguitch areas, giving you easy access to plenty of great attractions. Contact us today! We look forward to helping you make memories during your next family getaway!